A mystery hanging around in space since 1968 was recently explained by the Zetas, as no one else had an explanation other than perhaps an invasion of blobs from outer space or an odd shaped alien craft. The blob can be found on the NASA websites, on original photos which, when brightened, show the blob or various pieces of it. This issue gets revisited periodically, and was on the Discovery Sci channel in August, 2014. Per the Zetas, the blob has a simple explanation. Squid shaped UFO or Strange Space Bug. This was taken during the Apollo 8 mission. 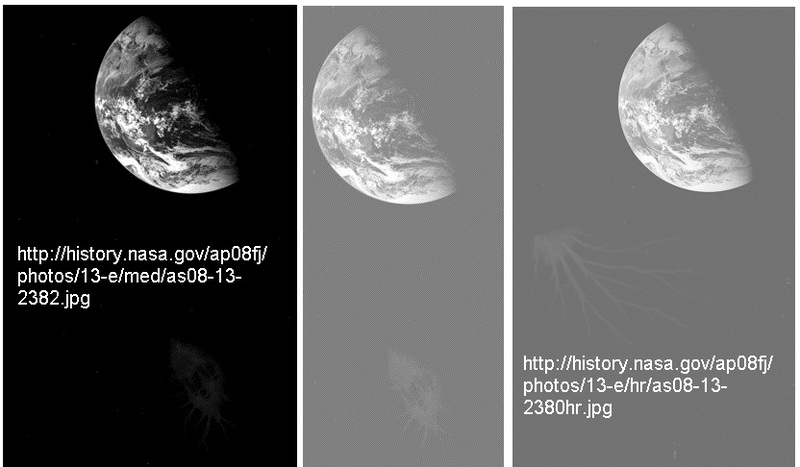 ZetaTalk Solution 8/23/2014: This space blob remains unexplained, by NASA, since it was captured in 1968 by the Apollo 8 space craft. Being a still photo, 2D rather than 3D, there is no way to accurately gauge its size. It might be close to the space craft, and thus not large, or far away and huge. It is the latter. Clearly the blob is at a distance from the Earth, which can be seen in the distance in the photo. What is it? There is all manner of substances surviving intact in space – dust, space junk from discarded satellites, water droplets, meteors and comets, and blobs. Like an amoeba, a blob can be pulled in this or that direction, and into many directions, simultaneously. An asteroid or piece of space junk retains its shape, and thus the draw of gravity or a magnetic attraction pulls on the entire object. But if composed of chemicals which congeal into a gummy substance, then portions of the blob can be tugged while other parts of it resist. The Apollo 8 blob is being pulled apart, by such an action, as can be seen. The tentacles are those portions of the blob wanting to travel downward, while another part of the blob, the head, is resisting. Most of the US Gold reserves reside at Fort Knox, right? Or is Fort Knox virtually empty? Rumors of mischief in the Gold business have been running for years, since 2004 when Rothschild stopped trading Gold. By 2009, stories about China being given Gold bars that were only Tungsten covered with Gold leaf were circulating. Tungsten has the same weight as Gold, and unless the bar is drilled to determine purity, this would not be discovered. Per the Zetas, these rumors are true! ZetaTalk Confirmation 12/26/2009: This story is true and will lead to chaos among those marketing gold, especially among those dealers who state they will house the gold that the public buys. No doubt a new business to certify gold holdings will develop and flourish. The issue of gold stolen from Fort Knox or fake gold bars minted during the past couple decades will never be officially admitted by any government involved. Rather, those who are passed false gold will quietly be paid off, and compensated. This issue is also rift with blackmail possibilities. Now comes word that the World Gold Council is closing half of its global offices and laying off most of its important analysts. Not only that, but the venerable N.M. Rothschild, an old name in the world of gold dealing, was closing its gold trading operations. Why Did Published List Of Gold Bars Shrink? Reports are circulating that similar audits of certain Asian depositories have already produced "good” delivery bars (400 oz or 12.5 kg gold bricks) that have been gutted and stuffed with tungsten — a metal whose specific weight approximates that of gold, so that the famous test of Archimedes (fl. 287-212 B.C.) based on the Law of Buoyancy, designed to expose fraudulent goldsmiths, would be inapplicable. Fake Gold Bars! What's Next? In October of 2009 the Chinese received a shipment of gold bars. Gold is regularly exchanges between countries to pay debts and to settle the so-called balance of trade. Most gold is exchanged and stored in vaults under the supervision of a special organization based in London, the London Bullion Market Association (or LBMA). When the shipment was received, the Chinese government asked that special tests be performed to guarantee the purity and weight of the gold bars. In this test, four small holed are drilled into the gold bars and the metal is then analyzed. Officials were shocked to learn that the bars were fake. They contained cores of tungsten with only a outer coating of real gold. What's more, these gold bars, containing serial numbers for tracking, originated in the US and had been stored in Fort Knox for years. Has The Gold In Fort Knox Disappeared? The US government had been overspending, exporting dollars oversees, and other governments had “cashed in” those dollars for gold. President Nixon had a choice – default on the US promise to redeem dollars with gold, or reduce spending. Forty three years later (since August 15, 1971) the “temporary” policy is still in place, the US government has officially redeemed no dollars for gold, and the US economy has deteriorated. The US national debt is approximately $17.6 Trillion – about fifty times the current market value of the US gold. Clearly selling all the US gold would not fix the insolvency or debt problems of the US government. The Fed recently refused to allow Germany to inspect their gold which supposedly had been safely stored in the NY Fed vaults for several decades. Clearly, the implication is that the German gold is also gone, there is much wrongdoing to conceal. If Fort Knox is virtually empty of Gold, where did it go? Let’s start the story at the beginning. Where did it come from? In 1933, with the world gripped in the Great Depression and China and Indonesia nervous about the threat of another World War incited by Germany and Japan, two significant moves were made to stock Gold in Fort Knox. First, President Roosevelt made it illegal for citizens to own Gold coins or bullion, forcing them to sell it to the Federal Reserve. 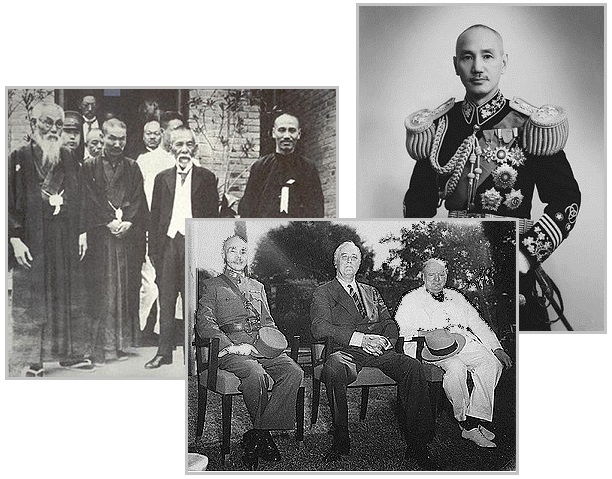 Second, Chiang Kai Shek in China, nervous about losing out during the China revolution and retreating to Taiwan, secretly entrusted China’s vast Gold reserves to the US in exchange for Gold Certificates. He was also nervous about Japan, which did invade China in 1937. Third, other Asian countries such as Indonesia followed Chiang’s example, and when Japan lost the war to the US, where do you suppose their Gold went? In 1933, U.S. President Franklin D. Roosevelt issued Executive Order 6102, which outlawed the private ownership of gold coins, gold bullion, and gold certificates by American citizens, forcing them to sell these to the Federal Reserve. The decade of 1928 to 1937 saw some aspects of foreign imperialism, concessions and privileges in China, moderated through diplomacy. Chiang Kai-shek antagonized the capitalists of Shanghai, often attacking them and confiscating their capital and assets for the use of the government. Chiang refused to surrender more than a fraction of the wealth that he had sent to Taiwan. Ben Fulford on Russian TV. No one knows how much gold is at the Federal Reserve. According to serious data, there is no gold at all. How did tons of Asian gold get into American safes? … Century by century, gold had been traveling to China on the Great Silk Road in exchange for refined products. The treasure that belonged to the Gomen Dan dynasty was infinite. The Japanese threatened to capture all the gold within the nearby Chinese territories. 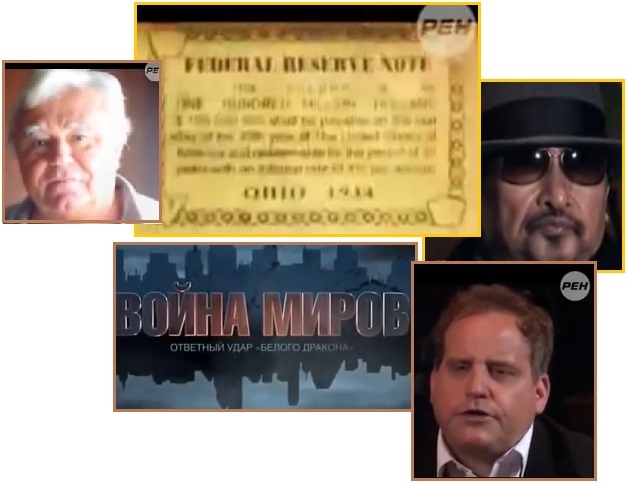 But the American Ministry of Finance and the Federal Reserve System offered Chiang Kai Shek to keep the gold in a safe place – storage in the Federal Reserve System. On November 13, 1933, the American warship USS Houston was sent from Shanghai to San Francisco, carrying the first portion of gold onboard. The gold was secretly given to President Roosevelt by Chiang Kai Shek. Later, other Asian countries followed the Chinese example. The Federal Reserve kept all the gold in its depository, giving the countries worthless bonds in return. ZetaTalk Explanation 8/23/2014: The Gold was collected in 1933 by an Executive Order, wherein Roosevelt ordered US citizens to sell their Gold to the government. Gold was also collected from Chiang Kai Shek and Sukarno, who were terrified of losing it to Japan, and stolen from Japan when they lost the war. Then the crash at Roswell happened, and those in control of the US mint and the Gold at Fort Knox learned of the coming Pole Shift and true to the nature of the elite, they thought only of themselves. 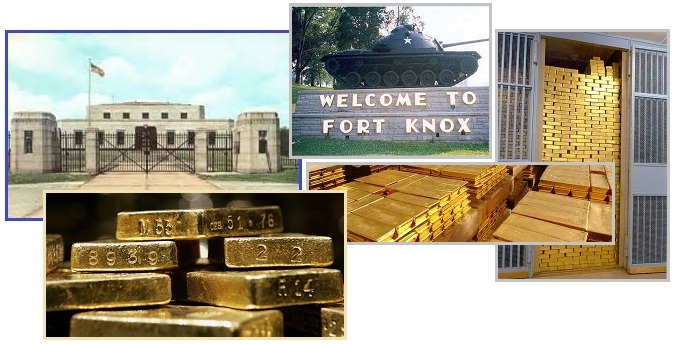 The last audit of the Gold at Fort Knox was done in 1950. Roswell happened in 1947. 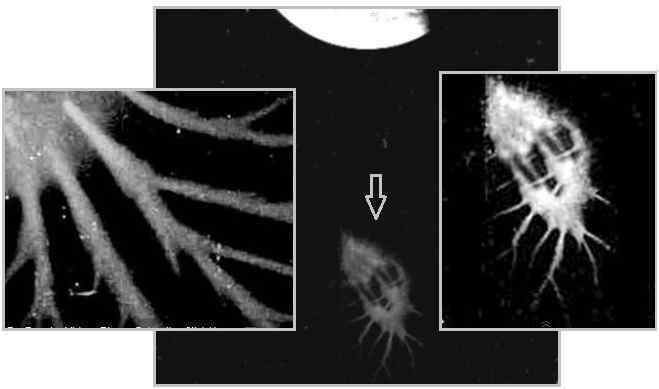 At this point, MJ12 had formed and the world’s elite were hearing about a pending Pole Shift caused by Planet X, aka Nibiru, to arrive in 2003. They resolved to keep this information to themselves, to keep their worker base in their jobs and taxes being paid. But meanwhile, all that Gold at Fort Knox was just too much of a temptation. Other than Rothschild leaving the Gold markets in 2004, and fake Gold bars filled with Tungsten in the news in 2009, were there any hints of this theft? Remember the Wanta issue in 2006? This hit the press due to a 2003 lawsuit in Virginia. 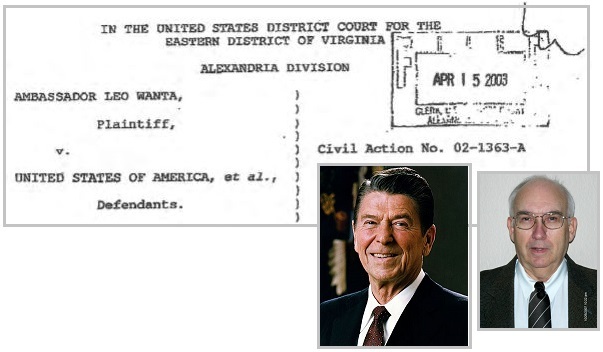 Wanta on June 12 entered into a negotiated settlement with U.S. authorities ending his quest to recover an estimated 27.5 trillion in funds first generated by Wanta on behalf of President Ronald Reagan at the end of the Cold War. After Reagan left office, the money was earmarked for the American people with Wanta as legal trustor, but instead he was backstabbed and the money hijacked by President George H. Bush and President William Jefferson Clinton in an elaborate offshore banking scheme to enrich their own pockets and the pockets of a select group of elite friends. The explosive Wanta story, which if followed up properly, could lead to indictments to Bush and Clinton, as well as many other co-conspirators who have defrauded the American people out of trillions of dollars. ZetaTalk Confirmation 12/30/2006: We have addressed the Wanta trillions as legitimate funds set aside since the days of Roswell for elite use during the forthcoming pole shift. The likelihood of these funds being put into the US Treasury, with the debt being dropped and an announcement made to the people is zero. ZetaTalk Confirmation 7/29/2006: A great deal more money than the Wanta money was siphoned aside, a great deal of money-laundering, drug running and the like, to get money for dealing with the pending pole shift. Would the truth be known, the American public would be horrified, especially when social services like universal health care are denied in the US. So, is that money there, and did the Clintons and Bush family steal some of it? Of course they did, and many other people had their hands in the till. ZetaTalk Insight 1/6/2007: Certainly the massive amounts of funds given to the DoD over the decades has never been accounted for, the amount supposedly 'lost' due to accounting flaws into the trillions. We have mentioned some means of filling these coffers, such as money stolen from the S&L chaos, when bank after bank was looted; drug running by the CIA even back to the Viet Nam war, when drugs came back inside cadavers, and during the Iran Contra days when the CIA was caught flying plane loads into the US. Now, per an RT broadcast documented on this video, another lawsuit revealing stolen Gold has occurred. In the District Court of New York on November 23, 2011, plaintiff Neil Francis Keenan is seeking a billion dollars. Ben Fulford reveals that an Asian group called the White Dragon is pursuing the stolen Gold for those defrauded by the Bush/Clinton crowd. Will the public ever learn the truth? Not likely, but then Gold and/or Gold certificates are going to soon be worthless. And those well stocked bunkers? They will either collapse on the smug elite who think they will be the survivors, or be taken over by hired militia who will kill each other off trying to establish a pecking order. True karma awaits! After WW II, the owners of the Asian gold bond holders united into an organization led by Indonesian president Sukarno. In 1963, Sukarno made an attempt to return the hidden gold in America. White Dragon states that Chinese gold hidden in America and elsewhere has not disappeared. Instead, it serves several family clans. And these people dictate the rules to the rest of the world. ZetaTalk Explanation 8/23/2014: If the last audit of Fort Knox Gold was done in 1950, and Nixon went off the Gold standard in 1971 to avoid having to swap US dollars for Gold on demand, no longer able to back the US dollar with Gold, then what is the status? Fort Knox has been emptied of almost all of its Gold, with only a few solid Gold bars for show with the rest of the inventory fake bars of tungsten covered by a thin layer of Gold. This will never be revealed to the world by any government, as all are either complicit, or terrified of assassination, or told it is all a national security issue. The US was the largest economy in the world for many decades, with a massive military as large as all others combined, and those with their hands in the till thought they would never be discovered. Periodically some part of the financial manipulation or money shuffle peeks out in the press, as when the Wanta funds were returned to the US Treasury in a sealed court case in 2006, or when the Gold stored at the Twin Towers was secretly removed just prior to the 911 disaster, or in the Ponte Chiasso case where legitimate Gold certificates in the billions were discovered being smuggled into Switzerland, or when China discovered Gold bars delivered by the US to be composed primarily of Tungsten. Developed during the Reagan/Bush/Clinton era, was a fraud during which the American taxpayer was robbed. The 2008 Housing Bubble inflated during the second Bush administration was likewise a fraud the American citizens and overseas investors paid for while Wall Street siphoned funds off for the elite. The perpetrators will never be brought to justice as they are powerful people and any bankers in the know find themselves conveniently committing suicide. Where did the money and Gold go? Many people doing services for these elite required Gold as payment, as it is untraceable and was assumed not to lose its value. Who were these elite, who have been robbing the US taxpayer and other countries since the days of Roswell? They knew first-hand about the pending Pole Shift as they were members of MJ12 and heard it from the aliens. They were the wealthy of the world, royalty, members of the Bilderberg group, and those who were in politically powerful positions. JFK did not play the game and was assassinated. Obama refuses to play the game and the assassination attempts against him are endless. The stolen funds went into underground enclaves which will prove to be worthless and virtual death traps. True karma will be at play, and well before the hour of the Pole Shift. Yet more proof that the Earth wobble is indeed a daily affair, and taking a swing every 6 hours or so, has been provided by ACE satellite data. ACE intuits the Earth’s magnetic field from the behavior of the solar wind. But why would the solar wind make a hiccup at regular intervals that relate to the points where the Earth wobble takes a swing? 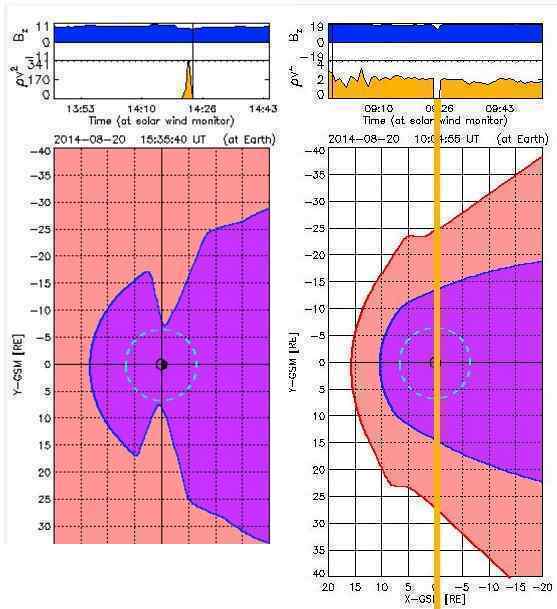 The ACE spacecraft monitors the solar wind from a position about 200 Earth radii (RE) sunward of the Earth. The real time solar wind data from this spacecraft allows us to predict what will happen at the Earth many minutes before the solar wind actually reaches us. Important solar wind values obtained from the ACE observations include the z-component of the interplanetary magnetic field (Bz) measured in units of nano-Tesla, and the dynamic pressure (also called the momentum flux) of the solar wind, measured in units of nano-Pascal. ZetaTalk Explanation 8/23/2014: The ACE satellite measures the Earth’s magnetic field by taking the pulse of the solar wind. What would cause the solar wind to twitch, when encountering the Earth’s magnetosphere, during the Earth wobble? At 10:04 UTC the globe is wobbling from the India slant (to the right) to the Italy slant (to the left). At 15:35 UTC the globe is being tilted forward, the Sun high overhead in the Americas when the bounce back from the polar push occurs. These are significant wobble points, and where often assumed to be gradual, the wobble is swift and decisive. So what is happening to the Earth’s magnetosphere during these times? We have explained that the Sun’s magnetic field spreads far outside the solar system, and that the solar system is within an even larger magnetic field that envelops the solar system. A magnetic field has what might be called super highways for magnetons to travel, bands that curve from the N Pole of a planetary magnet or sun to its S Pole. Normally these superhighways merge with each other where magnetospheres touch, so that rather than a clash there is a temporary merging of magnetons flowing in a direction, like a super highway taking on extra traffic during rush hour. When the Earth wobbles, this is in essence a sudden lurch. The sudden lurch creates a temporary clash where the Sun’s magnetosphere and the Earth’s magnetosphere touch. Even though the ACE satellite is only reading the solar wind, the solar wind reacts to this clash, and this is what the ACE is measuring. There are four turn points during the Figure 8 of the wobble – polar push, lean to the right, lean to the left, and bounce back. If one were to gather data from the ACE, it would show these four points as a temporary clash during the 24 hour period.